13121: Namiki Pilot R-T-type in box: full-size lever-filler in transparent celluloid with grey and black striations, 13.1 cm long, gold filled trim, black ends, 14K gold export nib, original price band on cap, original sac is hardened and has not been replaced. In original box with instructions. From the Oakland Japantown hoard. 13112: Namiki Pilot A-shiki in box: rare demonstrator-like plunger-filler in transparent celluloid with black streaks, 11.9 cm long, gold filled trim, black ends, 14K gold export nib, original price band on cap, barrel band lists US, British, and Dutch patent numbers. New old stock, original seals have not been replaced, pen not functional as is. In original box with instructions. From the Oakland Japantown hoard. 13117: Namiki Pilot Nomikomi-shiki in box: rare "easy-drink" filler in orange pearl and black celluloid, 12.2 cm long, gold filled trim, 14K gold export nib, original price band on cap. New old stock, fills by inserting pen into special inkwell (not included), inverting inkwell and pen together. Transparent celluloid internal reservoir tube has split with age (see detail), but a replacement could readily be made; outer barrel fully intact, original factory grease still present at section joint. In original box with instructions. From the Oakland Japantown hoard. 13787: Pilot Super 200: green tab-filler, 13.35 cm long, gold plated trim, inlaid 14K gold nib, new old stock with original price band on barrel. 13627: Pilot Custom in box: black cartridge-filler, 13.45 cm long, gold plated trim, 18K nib. 13261: Pilot Custom set in box: black cartridge-filler, 13.45 cm long, gold plated trim, with matching ballpoint and 0.5 mm mechanical pencil; new old stock, fountain pen retains sticker on barrel; 14K nib, box with outer sleeve. 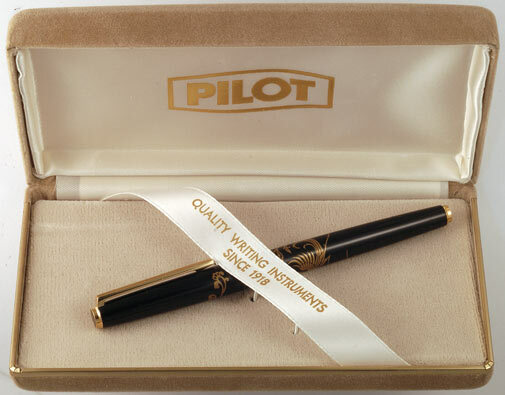 13269: Pilot FD in box: black lacquer with signed maki-e decoration of phoenix, 13.2 cm long, gold plated trim, 18K nib, squeeze-filler converter included; new old stock in box with outer sleeve. 13253: Pilot FD in box: black lacquer with signed maki-e decoration of flying crane and clouds, 13.2 cm long, gold plated trim, 18K nib, squeeze-filler converter included; new old stock in box with outer sleeve. 13266: Pilot FD in box: black lacquer with signed maki-e decoration of plum blossoms, 13.4 cm long, gold plated trim, 14K nib, squeeze-filler converter included; new old stock in box. 13265: Pilot Capless/Vanishing Point in box: glossy black, facetted barrel, 14K nib, new old stock, hang tag on clip, still sealed in plastic, in box with instructions, outer sleeve. 13246: Pilot Grandee in box: smooth sterling silver cartridge-filler, 13.3 cm long, squeeze converter included, 14K white gold nib, in Art Craft box with instructions, spare ink cartridge, outer sleeve; new old stock, light tarnish. 13264: Pilot Grandee in box: smooth sterling silver cartridge-filler, 13.3 cm long, chrome plated trim, squeeze-filler converter included, 14K white gold nib, new old stock, in Art Craft box with instructions, spare cartridges, outer sleeve. 12854: Platinum Sharp commemorative Ever Sharp pencil in box: specially made for the Sharp Electronics Corporation, to commemorate one of founder Hayakawa Tokuji's first products; injector pencil uses .5 mm lead, chrome plated trim with applied spiral pattern; in gift-wrapped original packaging. 12935: S. Eto Vanco double-lead two-color pencil in box: made in Osaka, Japan, 11 cm long, chrome plated trim, uses 1.1 mm lead; turn the crown one direction to extend the black lead, the other direction to extend the red. Grey pearl and black celluloid resembles a color used on Sheaffer's subbrand pens of the 1930s, but lower quality with a few areas where shrinkage has left small depressions in the surface. New old stock with instructions, some age dulling of plating. 12934: S. Eto Vanco double-lead two-color pencil in box: made in Osaka, Japan, 11 cm long, chrome plated trim, uses 1.1 mm lead; turn the crown one direction to extend the black lead, the other direction to extend the red. Wild swirled red and grey celluloid. New old stock, with instructions, minor plating dulling from age. 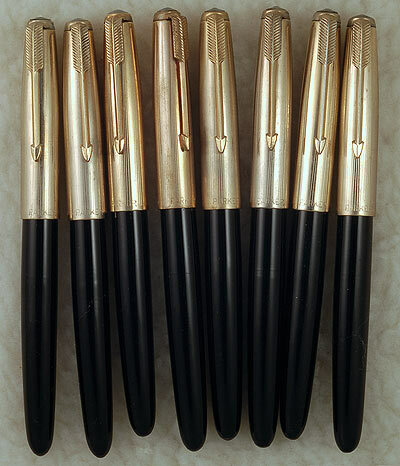 12721: unmarked Parker 51 counterfeit: black with metal cap marked "14KR GOLD FILLED" but with only a very thin gold wash; fully marked in imitation of a real 51, sac hardened, will need to be replaced; plated nib, cap jewel is opaque silver in color. Probably made in Japan, quality is low but much historical interest. Unused with shop wear, eight available.